Heat oven to 350°F. Spray bottoms of 2 (9-inch) round cake pans with cooking spray. * Make brownie mix as directed on box for cake-like brownies using oil, water and eggs. Spread half of batter evenly in each pan. Bake 18 to 23 minutes. Cool on wire racks 10 minutes. Run knife around brownie layers to loosen. Place wire racks upside down over pans; turn racks and pans over. Remove pans. Cool completely, about 35 minutes. Meanwhile, in small bowl, beat granulated sugar and cream cheese with electric mixer on medium speed until well blended. Beat in strawberry yogurt until smooth and creamy. Fold in chopped strawberries. Refrigerate while brownie layers cool. In 1-quart saucepan, heat whipping cream over medium heat, stirring constantly, just until cream begins to boil. Remove from heat. Add chocolate chips; press into cream. Cover; let stand 3 minutes. Vigorously beat with wire whisk until smooth. Cool completely, about 30 minutes. To assemble torte, place 1 brownie layer on serving plate. 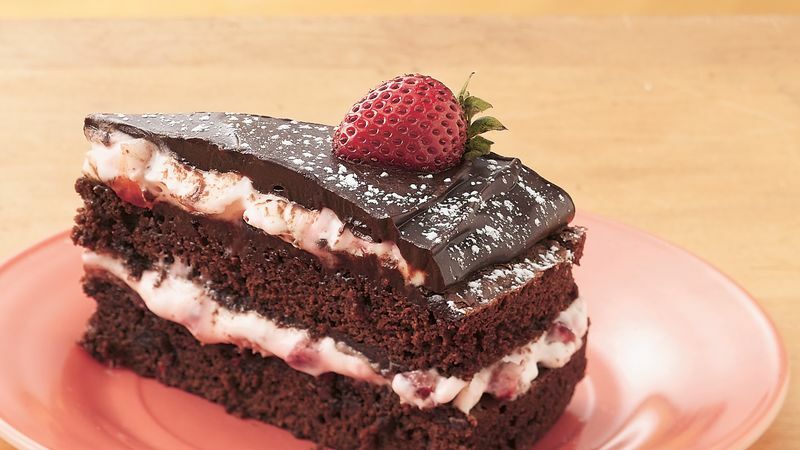 Spread half of strawberry cream evenly over brownie to within 1 inch of edge. Carefully spoon and spread half of chocolate fudge almost to edge of strawberry cream. Repeat layers, ending with chocolate fudge. Arrange halved strawberries in spoke fashion on top of torte. Refrigerate at least 1 hour before serving. To serve,** sprinkle powdered sugar over top of torte and around plate. Carefully cut torte with hot knife into wedges to avoid “cracking” of chocolate fudge on top. Store loosely covered in refrigerator. *For easy pan removal, line bottoms of pans with waxed paper before spraying with cooking spray. **If torte has been stored for more than 3 hours before serving, let stand at room temperature 10 minutes before cutting.